It's geeks versus jocks in an epic battle of the beverages! 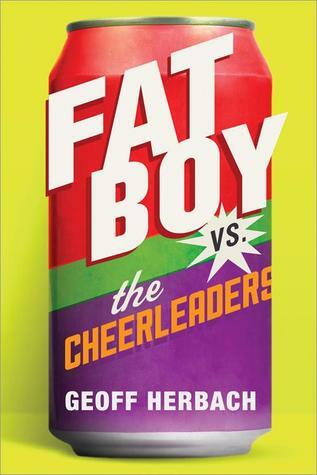 From "one of the most real, honest, and still funny male voices to come around in a while" (YALSA) comes a brand-new cast of quirky characters, pitting fat boy Gabe against the high school cheerleading team in a battle over control of the school's soda machine. The war is ON! Never have the stakes been so high. Never have the trenches been so deep. Never has one soda vending machine been so vital. When the high school cheerleading team takes over the machine's funds previously collected by the pep band, Gabe will not stand for it. Something must be done. It is so hard to find books that boys would want to read. Geoff Herbach did a great job of finding that male voice that will speak to many readers when he wrote Gabe. Gabe was very entertaining. I loved how layered he was. Gabe is overweight-- okay really overweight-- and hides behind his insecurities with humor and food. We hear that a lot about girls, but not so much about boys. Why would a boy be insecure? Eating your feelings, what? What male teenager is in tune with that? Gabe certainly isn't until he has an epiphany. In one single moment he starts to realize what's wrong at his highschool and ultimately in his little world, and he gets mad. From that point on it's a pretty amusing story of finding oneself, breaking molds, learning to accept the harshest of life's lessons, and taking a stand. Gabe does all of these things with biting humor and great insight. The writing style I did not care for, but I can see it being appealing to younger readers. Fat Boy does not unfold like a traditional story since it's being told "deposition style" to the police. For me, that got annoying because all I could tell of certain character interactions was from Gabe's words and actions. It made me feel like an outsider to the story. However, I stuck with it and kept going because I liked the story that Gabe had to tell. I'm filing this one away as another good book for teenage boys.